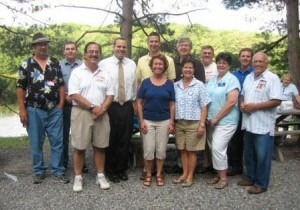 The Clearfield County Republican Committee welcomed over one hundred elected officials, candidates, and guests to a picnic held July 19 at Parker Dam State Park. Keynote speaker Tom Baker, Vice President of Big Brothers Big Sisters of Pittsburg and president of Baker Leadership, talked on the importance of service to our communities. It was noted that almost everyone in attendance volunteers in their home towns. Committee Chairman Arleen Multhauf welcomed the group and introduced candidates. Vice Chair and Republican State committeewoman Susan Williams discussed the opportunities to volunteer for this year’s general election as well as the 2012 Presidential election. The committee will again have a booth at the Clearfield County Fair and volunteers are welcome. Pictured are (first row) Kim Kesner, County solicitor and candidate for district attorney; Linda Hatcher, jury commissioner; Joan Robinson McMillen, county commissioner; Maurene Inlow, register and recorder; Roland Bechtel, candidate for DuBois Area School Board. (second row) Tom Dixon, candidate for Boggs Township supervisor; Darrell Duttry, candidate for Sandy Township supervisor; speaker Tom Baker; Matt Gabler, state Rep. 75th District; John Sobel, county commissioner: Jerry Nevling, candidate for magisterial district judge; and Tommy Sankey, candidate for state Rep. 74th District.